Picture this: Your refrigerator orders your groceries when food supplies are low. Even your coffee machine orders your favourite coffee beans and brews it as soon as you wake up. From energy consumption to air quality, your house gives you the latest information. These are some features of a smart home, wherein a communication network connects different appliances that can be remotely controlled, monitored and accessed. It is the Internet of Things (IoT) that makes your home a "smart home". What exactly is the IoT? It is a system of internet-enabled connected computing devices that use embedded processors, sensor and communication hardware to collect, send and act on data. In the smart home model, the IoT improves the living conditions of the occupants. So how can we get smarter healthcare? The convergence of digital and biomedical innovation can facilitate the creation of patient-centric disease prevention, early detection, diagnosis, treatment, and care. Even governments are becoming aware of the revolutionary power of personalized healthcare. For instance, the US administration launched The Precision Medicine Initiative in 2015 to advocate a patient-centric approach to improving the quality of life. Imagine that these data sent via the internet could alert a physician to intervene. Remote real-time patient monitoring reduces healthcare costs as it saves visits to the doctor's office. Such smart solutions provide promising remedies to face the challenge of ever increasing health care expenditure due to longevity and chronic diseases worldwide. Furthermore, the possibilities offered by smart health touch a more personal chord. Patients are able to actively engage in their health, causing them to be more compliant, which is a challenge for many treatment regimens. As we move from an one-size-fits-all approach for providing healthcare towards a more personalised approach, new technologies are emerging that are capable of characterizing each patients' unique genomic, proteomic or metabolic profile. These technologies focus on improving diagnosis, guiding the development of targeted therapies as well as monitoring drug activity and therapeutic response for various diseases. A hot-spot for such technologies is the field of oncology. Here, in-vitro diagnostic (IVD) devices, which perform tests on human fluid or tissue samples, identify cancer-specific characteristics also known as cancer biomarkers. In other cases, DNA mutations of certain genes leading to alterations in cellular signalling pathways serve as biomarkers. For example, it has been shown that colorectal cancer patients with unmutated RAS genes will benefit from therapeutic approaches that block the EGFR (epidermal growth factor receptor) by antibodies such as cetuximab or panitumumab. However, patients harbouring mutations in the RAS genes do not respond to anti-EGFR therapy. (4) PCR-based in-vitro molecular diagnostic tests such as the OncoBEAM RAS CRC Kit detects RAS gene mutations from plasma of late stage colorectal cancer patients. The biomarkers described above represent two kinds of biomarkers, namely: predictive and prognostic. · Predictive biomarkers predict the response to specific therapy. E.g. RAS- mutations in patients with colorectal cancer. · Prognostic biomarkers mostly inform physicians regarding the risk of cancer recurrence or future disease progression. E.g. MKI67 (proliferation marker Ki 67) in patients with breast cancer. Stratifying patients into drug-responsive vs nonresponsive or progressive populations based on the expressed biomarker(s), whether protein-, DNA- or RNA-based, ensures that the patients benefit from the appropriate or future therapies. The more we learn about the precise cause of the disease by accessing data from patients, the more biomarkers would be identified. In addition, pharmaceutical companies also can design drugs that target particular molecules in the pathways that are associated with alterations identified by these biomarkers. Consequently, huge amounts of data are being generated and captured. These emerging "big data" collections consist of both biological samples and computer data stored in biorepositories or biobanks, for research and personalized medicine purposes. (5) Several biobanks already exist and more are being established worldwide, e.g. German Biobank Node and the EuroBioBank (6, 7, 8). We can harness the possibilities offered by "big data" in biobanks for disease prevention, detection and research purposes. 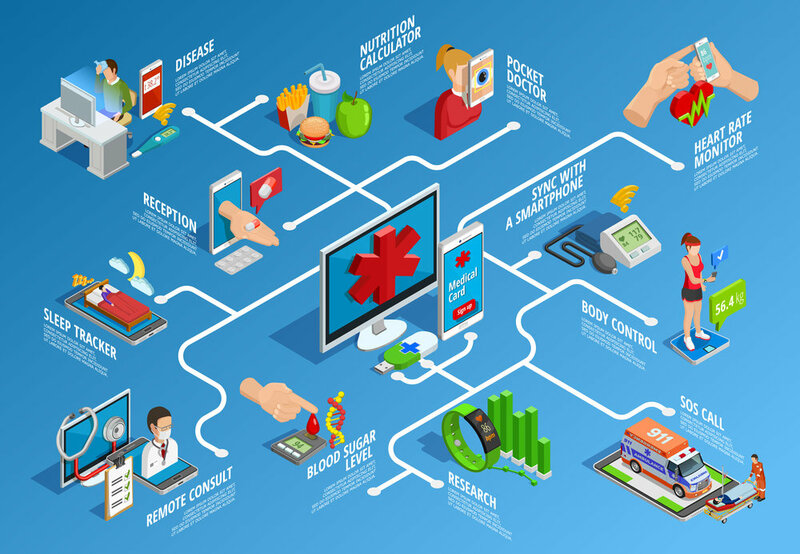 Can the model of IoT in smart homes be extrapolated to make healthcare smarter? In the smart home, environmental data is constantly collected by devices that are interconnected through IoT. Similarly, diverse sources can capture data regarding a patients' health, which are eventually deposited into biobanks. In smart healthcare, IoT could play an important role in connecting a patient with biobanks, and the biobanks in turn with the diagnostic and pharmaceutical companies, as well as physicians and researchers. Wearable devices already exist to collect data that could be added to the biobank. Even early stage mutations could be catalogued and eventually associated with a certain probability of causing a specific disease. IVD tools and drugs can be designed to target specific diseases and deliver personalised healthcare to the patients using data available in the biobanks. Imagine a scenario where a diagnostic test would identify mutations in a particular patient. Based on this information, the pharmaceutical company goes ahead and develops a drug that benefits this patient. After checking this information, the physician can now decide on the course of treatment. Such harmony can only be achieved via the sharing of data. While the use of IoT in healthcare is an exciting prospect, several hurdles need to be overcome first. Not only do the patients' data need to be protected, but also the IoT devices need to be secure. Security breach and ethical considerations are major concerns due to the potential of misuse of patient data. Therefore, the EU has recently introduced regulations called the Global Data Protection Requirement (GDPR) to protect and safeguard digital data. Although GDPR is a step in the right direction, it applies only in the EU countries. IVDs have been playing a major role in gathering information and giving insights into the link between patients, their illnesses and their treatment. However, only 2.5% of the total healthcare expenditure is allocated to the IVD medical device industry. (9) More investment in diagnostics and medical devices would help in creating a smart healthcare system. Companion diagnostics (CDx), a new breed of IVDs that combine diagnostics and treatment, could bridge this gap, and are already being implemented on cancer patients. (10) Based on the FDA definition, a companion diagnostic provides information that is essential for the safe and/or effective use of a particular drug or biological product. We are at an exciting juncture wherein IoT is poised to link the different healthcare sectors to provide the most personalized medicine possible. Diagnostics and medical devices will play a more central role in capturing complex data for delivering this personalised medicine. With such an approach, we may be able to identify biomarkers of disease, anticipate patient responsiveness to a drug and predict adverse drug reactions.